Hello various media members, here is the weekly Thunderbirds recap report. It was a very successful weekend for the Thunderbirds to open their 2018-19 campaign. The team took 6 points out of 6 with a 4-3 win on Friday night and a 6-0 win on Saturday night over the Port Huron Prowlers. Friday’s game was a back and forth affair that was ultimately decided by the captain Josh Pietrantonio scoring his first goal of the season on a tip from Stan Vlasov’s shot with 3:10 to go in the game to secure the opening night win. Pietrantonio, Jiri Pargac, Joe Cangelosi and Vlasov all had multi point nights to start their 2018-19 campaigns off strong. Saturday’s game started with a couple of roster moves for both teams. After Friday’s game both Edgars Ozolins and Austin Fetterly for Port Huron were suspended and unavailable for the Prowlers. 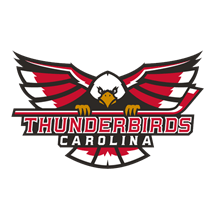 On the Thunderbirds side, Viktor Grebennikov was promoted to the 20-man roster, Cody Oakes was de-activated in a corresponding move. The Thunderbirds took full advantage of the smaller Port Huron roster and came out on fire notching four goals in the first period en route to a 6-0 win to sweep the weekend vs. Port Huron. Defenseman Karel Drahorad had two goals and an assist in the first period alone, and goaltender Henry Dill secured his first professional shutout with a 22 save night. During Saturday’s game, head coach Andre Niec was ejected during the second period and team president and GM Scott Brand came in to finish behind the bench. The FHL is currently reviewing Niec for a possible suspension. The Thunderbirds sit atop the FHL Standings with a 2-0-0-0 record for 6 points. Carolina now prepares for the upcoming weekend against the Elmira Enforcers Friday and Saturday night at the Fairgrounds Annex.